When Mom and Dad start to need a little help throughout the day, it’s a good time to consider a Personal Care community. When you’re visiting different senior living communities, knowing the right questions to ask can help you make your decision as you look for a community that has everything Mom or Dad wants, plus the care for healthier, worry-free living. When asking about the food at a community, it’s important to ask how the culinary team caters to special diets. Ask about options for diabetics, and for those on low-sugar or low-sodium diets. You should make a reservation to have lunch or dinner at the community, and while you’re there, pay special attention to the variety of choices offered. Here at Glen Mills, for example, we like to offer a mix between upscale dishes and hometown favorites that remind residents of meals in Mom’s kitchen. 2. What type of care will my family member receive? There’s a lot of confusion surrounding the different levels of care offered by senior living communities. Personal Care benefits seniors who need assistance with activities such as bathing, dressing, transfer, ambulation, medication management, as well as getting to community programs, and transportation to doctors’ appointments. A skilled nursing facility benefits more chronically ill residents, with a more clinical setting. You want to be sure to ask if the community you’re touring offers a nurse on site 24 hours a day, not just “on call”. If you can find that in a Personal Care community, it will make a big difference when it comes to your peace of mind. 3. Are there a variety of activities for every interest? One of the greatest benefits of a senior living community is the opportunity to stay active, return to favorite pastimes, and to be able to socialize with friends, rather than staying at home alone. It’s a good idea to ask the communities you’re touring for sample activities calendars, and also how involved residents are in the programs. If residents are leading clubs and giving presentations, that’s a good sign that the activities program is strong. Suzanne welcomes families looking at different senior living communities to visit Glen Mills Senior Living for lunch or dinner and a personal tour, designed to answer all of your questions. 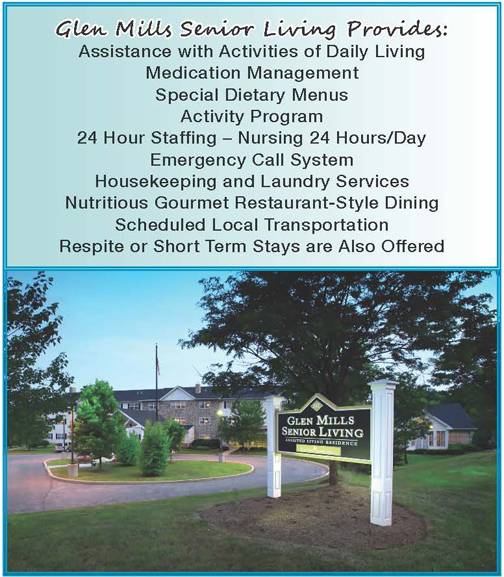 Located at 242 Baltimore Pike in Glen Mills, Pennsylvania, the community provides a Personal Care residence, as well as on-site Rehabilitation for residents and area seniors recovering from surgery or a hospital stay. Suzanne welcomes you to call Glen Mills Senior Living at 610-358-4900 to make your lunch or dinner reservation and learn about this month’s specials. The Lord has provided a safe and happy place for those that need assistance in living their daily lives. 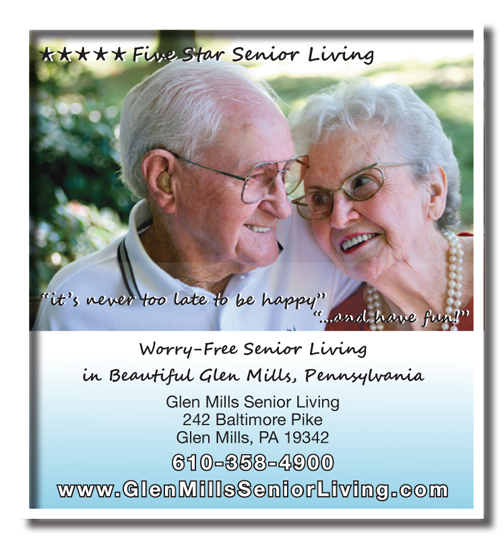 We thank God for the wonderful, loving and attentive staff here at Glen Mills Sr. Living for all they do in caring for my Mom and Dad.